I have been waking up with a really sore upper back and shoulders every morning, and I think it's because I read right before going to sleep and I lean up against our wooden headboard when I'm reading. I must gimp my neck or something. 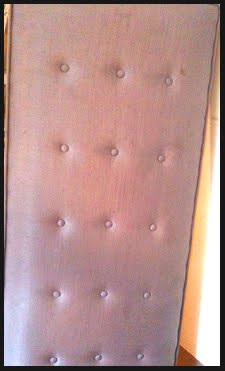 Over the weekend we went garage sale shopping--looking for garden pots--and I found this really neat padded headboard. Epiphany--no more sore shoulders. Unfortunately, when I tried to buy the headboard the woman told it was already sold. I thought about making one and I think I could build the frame and do the padding and fabric, but I have no idea how to do any fancy things like the cute buttons. I looked for upholstered headboards at CSN stores, and so far this one is my favorite. Ahh... soft and padded, My neck and back feel better already. Plus, I'll been the queen of my domain which such a regal looking bed. 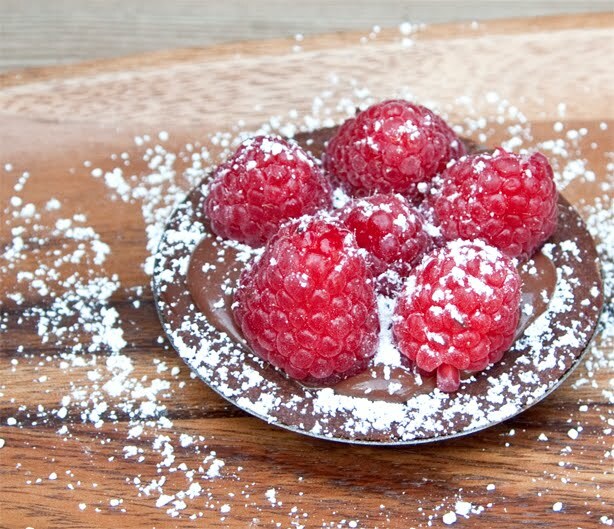 The last thing I ordered from CSN was a bunch of tart pans, including the adorable mini-tart pan that I used to make the chocolate-raspberry tarts. I ordered 6 or 8 of them since they're pretty tiny. And so cute--just one or two bites and you can eat the whole tart. The crust I used for the tarts is Chocolate Short Dough from Sherry Yard. It's really easy to put together and is versatile so you can freeze any leftovers and use them later to make other tarts or pies. To me, the dough tastes exactly like dark chocolate brownies. The filling I used is a vegan milk chocolate ganache and it's super simple to make. 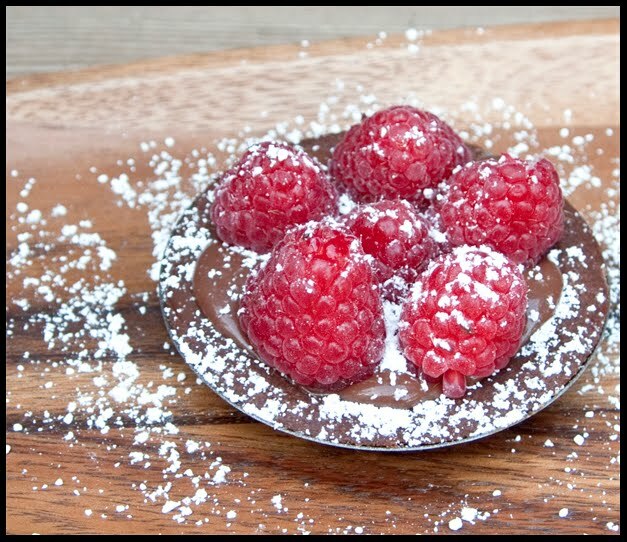 I topped the ganache with fresh raspberries and powdered sugar. Sift together the flour and cocoa powder into a medium bowl and set aside. Beat the butter with a mixer on low speed for 2 to 3 minutes, or until lightly creamed. Stop the mixer and scrape down the sides of the bowl. Add the powdered sugar and mix for 30 seconds. Scrape down the sides of the bowl. Add the flour mixture and mix on low speed just until the dough comes together, about 30 seconds. Remove the dough from the bowl and wrap it in plastic wrap. Chill for at least 4 hours. At this point, the dough will keep in the refrigerator for up to 3 days or it may be rolled out and frozen for up to a month. Roll or press out and pre-bake the dough in a 350F oven until it is just starting to brown. With these mini tart pans, that was about 7 minutes. No only are you a master baker but you make your own headboard! You are too much, Michele. Love those little chocolate-raspberry tarts. The mini tart is so pretty! I've seen instructions for making a padded headboard, but I think if I tried it, mine would be really sloppy.